You have most likely seen usnea, also known as Old Man’s Beard, when you are out in the forest. I see it all the time hanging in long strands from conifers when I’m hiking here in the pacific northwest. What you may not have known is that usnea is a super medicinal lichen! I love it when I find out that a plant (or lichen in this case) that I’ve seen for years is beneficial in some way. 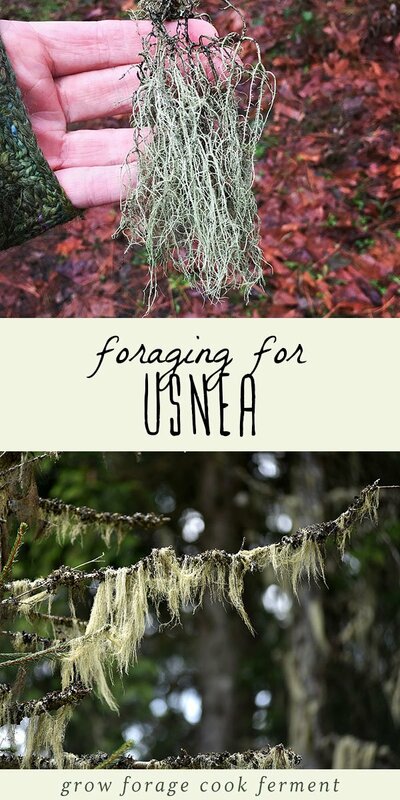 Foraging for usnea and learning how to identify it isn’t difficult and is the first step to using this powerful natural medicine. Usnea is a lichen that grows worldwide on the bark of trees, usually conifers, but can also be found on oak, hickory, walnut, and apple trees. 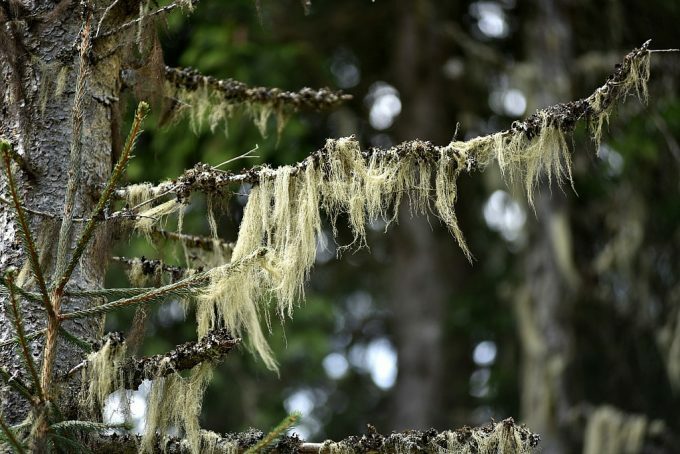 It often grows in long beard like strands, which is where it got the nicknames Old Man’s Beard and Beard Lichen. One good way to positively identify usnea is to pull apart the strands and see that it has a stretchy white core in the center. It is the only lichen with a white core. Usnea is a great plant to forage in the winter time when there isn’t much else available. Read more about winter foraging here: What to Forage in Winter: 30+ Edible and Medicinal Plants and Fungi. When collecting usnea, it is best to only gather what has fallen to the forest floor, rather than taking it straight from the tree itself. This is because lichens grow very slowly. When you are out walking in the woods where usnea grows, keep an eye out for usnea on fallen branches and gather from there. One interesting thing to note is that lichens like usnea are sometimes used to determine air quality because they won’t survive in polluted air. So if you are in a forest that is full of usnea, breath deep because the air is pure! While usnea is edible, it isn’t particularly tasty and can cause some stomach upset if it isn’t leached properly. 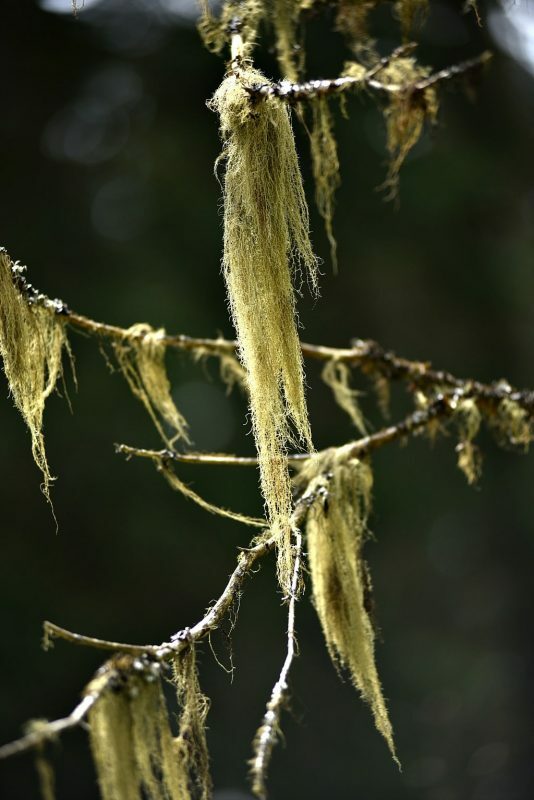 Where usnea really shines is with its amazing medicinal benefits. First and foremost, usnea is an immune system tonic and has powerful antibiotic and antiviral properties. It has amazing benefits for the respiratory system and can effectively help to heal bronchitis, pneumonia, sinus infections, strep throat, colds, flus, and other respiratory complaints. It is also highly beneficial for urinary tract and kidney infections. The best way to use usnea for healing is to make a tincture. Usnea is known as a wound healer and helps to prevent infection. It can be made into a poultice to be applied directly on a wound, which is good to know when you are out hiking in the woods! Usnea is such a great lichen to know about. It grows almost everywhere and has some amazing medicinal benefits. It is a very safe herb that can be used by the whole family. Take some care when collecting it and bring it home to turn it into a tincture to include in your herbal apothecary for optimum wellness! Does it grow in New York State. My sister makes herbal remedies and lives in central NY State. Usnea is also used as a natural orange dye on wool. I live in country Victoria, Australia and we have 280 acres of pine forest. Will look for this lichen. We do have plenty of Saffron cap mushrooms and slippery jacks though. Any medicinal uses for these? Where can I get info on dosages of the tincture? I live in Randolph, Maine and I was wondering if Usnea could be found here? What part of the country does this grow? Do you know the millimeters pet “dropper” for the tinture dosage? I can’t find it anywhere. :/ Thanks. Are all the Usnea species medicinal? We have several species here in the South West of England. I use a lot of our native plants both as food and medicine but had not considered using Lichen. Not sure why I have overlooked such a valuable one but aim to now if I have the right species here. As long as it is Usnea and not another lichen then it is medicinal. There are many varieties of USNEA! Are they all medicinal. Which variety is the best? Thanks Colleen, Yes, it is a great herb! I’ve admired this beautiful lichen for a long while and was extremely happy to come across your article and pictures and finally know how truly wonderful and healthful it is. It grows in abundance here in SW Wa. on our Alder and Fir trees, the short kind on the Alder and the long kind on the Fir trees mostly. After yesterdays wind storm left Usnea strewn across our yard I collected some and made a pot of tea with a few Rosehips and Hawthorn berries added, it was delicious. Thank you for the tincture information also. 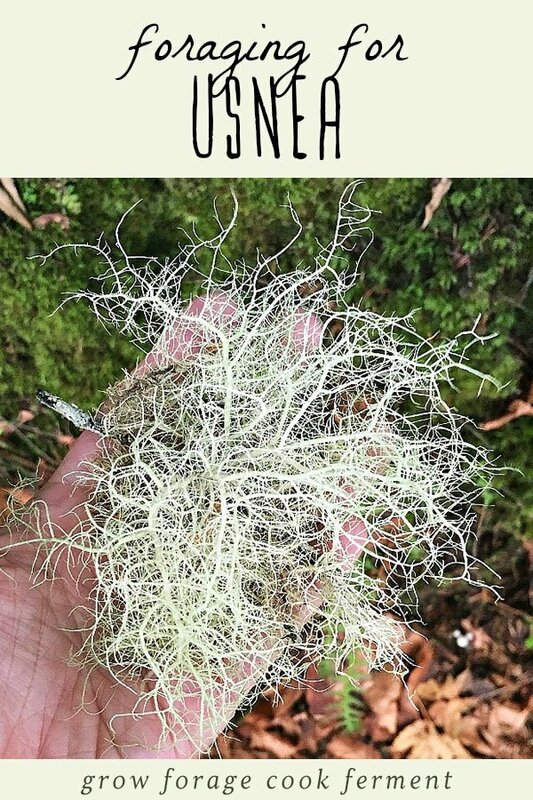 Thank you for posting this article on the usnea! We have so much of it around on our property and i have always enjoyed picking it up just to look at it. But today i will go and pick it up to make this!